First North American ‘Feathered’ Dinosaur? Out of the drawers at the Royal Tyrrell Museum of Palaeontology were stored specimens that were discovered in upper Cretaceous, which is when true birds were already flying around the earth when they lived. Impressions of mostly straight lines was interpreted to be that of “feathers” on a dinosaur! Artwork began to emerge in the media as it just loves to hype up these kinds of things, the specimen was touted as the very first North American “feathered” dinosaur! Where was the critique or alternative analysis in these publications that were claiming that those mostly straight line impressions were not only feathers but claiming the dinosaur was using those alleged feathers as a courtship display like the BBC, science daily, phys.org, and even live science? In Zelenitsky’s paper, where all this hype is coming from, words like vane, and pennaceous are noticeably missing throughout the paper! One does find the word barbule being mentioned. Further, these supposed “feathers” are not connected to the skeleton, rather the impression in the rock is separated by a centimeter or more at various angles from parallel to almost perpendicular. They give it a name, Ornithomimus which means “ostrich-mimic” dinosaur which they claim has a filament or shaft, much simpler than the complex vanes of true feathers with their barbs, barbules and interlocking hooks. This species is different from other claims of ‘feathered’ dinosaurs, because those others were lizard-hipped dinosaurs and this one is, bird-hipped. This adds to the complexity of the evolution of birds from dinosaurs because it would claim that dinosaurs had feathers long before flight. They admit, their new discovery (interpretation) is too heavy to fly. So they suggested it was some sort of courtship dance. It is interesting to note, that the adult had the scratch like impressions (labeled as feathers) but one juvenile did not have it. The third had markings on the bone itself. The paper stretches hard data for imagination by claiming that criss-cross markings on the bone are inferred traces left by shafted feathers without bearing any resemblance to actual feathers! Yet we see their artwork showing the adult with fully-fledged wing feathers, barbs, barbules and all, and even multiple colors! Talk about using the imagination with so little data. Whatever the markings mean, they complicate the story of dinosaur-to-bird evolution. Part of the reason of all this hype over little markings on a bone and mostly straight line impressions in the rock, is because they use dinosaurs to try and spark interest in evolution ( they know that kids love dinosaurs) and do not like the fact that dinosaurs fit well in the biblical creationism. So was there a first North American “feathered” dinosaur that was discovered in storage at a museum? The answer of course is no, there is not enough evidence to suggest that the animal had a courtship dance with all its colors of its feathers! There is a pattern emerging about this latest and surprising discovery which will be discussed in a moment. Most of these discoveries come from either Germany or China, and often times involve the same fossil-hunters, and often times come from private collectors! Giving the name, Sciurumimus which was discovered in Germany in the hands of a private collector which means “squirrel-mimic.” The fossil is a juvenile in a typical “dinosaur death pose” found globally in other places which creationists believe suggests a rapid suffocation in water caused by a global flood. Nature News dubs this discovery as having “protofeathers” but one would be looking in vain to find feathers with barbs and barbules as found in birds! You see, type 1 protofeathers are also found on you, horses, dogs, cats, and other animals who have hair! 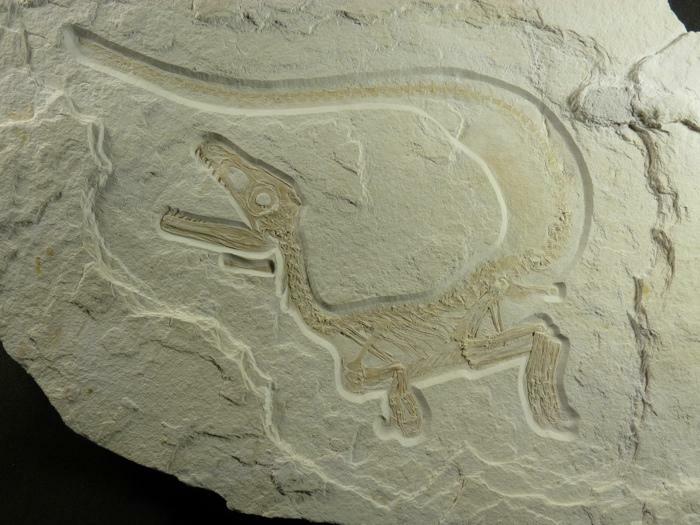 One of the reasons for the surprise is that the fossil appears in the same limestone in northern Bavaria as Archaeopteryx which was discovered 150 years ago, that was fully fledged with flight feathers: meaning, at the very least, that this creature and birds with powered flight were already contemporaries. This rises questions and causes additional complexity in the evolutionary story. “Repeat evolution” is being invoked in order to connect this dinosaur with evolving feathers that can be eventually used for flight within in future creatures, but not all are sold on the idea that this dinosaur is related to birds. This rising another question, if a fossil was found exquisitely preserved and its tail was clearly seen but none of the internal organs were not observable, would you then postulate that dogs were evolving flight? There are complications with this discovery if one attempts to connect it with evolving flight…The “protofeathers” are on the wrong animals! Their dates overlap, or belong in the wrong eras. The discoveries do not demonstrate a progression in complexity over time till true powered flight is thought to have evolved. They are either simple protrusions, or complex feathers found on animals that clearly used them for flying or gliding or perhaps were even secondarily flightless! Indeed, what do that have to say about one of the biggest shockers in discovering dinosaur fossils for proponents in evolution? Interesting enough, they didn’t do much bragging about this particular discovery other than the usual line of increasing understanding in their particular framework. But back in 2008, they tried to undermine her research. Thomas Kaye from the Burke Museum of Natural History in Seattle with two colleagues concluded what they observed in the dinosaur bone was nothing more than a bacterial biofilm that grew in the hollow spaces inside the fossils! Mary Schweitzer stood by her claims of the discovery and most likely was thrown back a bit by the opposition she was getting. But this challenge to her study was highly questionable, why was biofilm inside fossilized bone discovered now after centuries of collecting fossils? How could these biofilms conform to original tissues and then persist after they decay away or fossilize and remain unaltered for 68 million years? Even Kaye’s team conclusion would suggest that these bones are not that old. In 2009, it was official, the soft tissue discovered was indeed, blood vessel proteins and structures resembling cells and it wasn’t the only animal! “A controversial finding that protein fragments can be recovered from dinosaur fossils has been replicated for the first time. Two years ago, Mary Schweitzer, a paleontologist at North Carolina State University in Raleigh, and colleagues stunned the paleontology community when they reported discovering intact protein fragments in a fossil from a Tyrannosaurus rex that died 68 million years ago. Does it really increase understanding concerning the story of evolution? Supposedly 68 million years old with soft tissue and finding more with a supposed age of 80 million years old. Soft tissue degrades quickly, it’s not logical to conclude otherwise for any theory. So there is no increase in understanding evolution but a lot of back peddling which is why secular paleontologists danced around this discovery. Christians however, rejoice in findings because these soft tissues found in the fossil of T-Rex and another animal are not reformulating what the Bible says but rather confirms it! Does Foot Feathers Prove The Controversy Over Bird Evolution? “Extensive feathering of the pes [foot] is also seen in some modern birds, and serves an insulating or protective function. In most cases the feathers are not organized into a coherent planar surface as in Microraptor, Pedopenna and Anchiornis, which indicates that the pedal feathers of these fossil taxa may have differed from those of extant birds in having an aerodynamic function. The argument of this fossil actually makes evolution more cloudy than ever on this issue because going from four wings to two wings is devolution rather than progressing evolution. There is no clear picture of evolutionary powered flight. It’s uncertain if this animal could actually fly or even the feathers were nothing more than used for insulation. It is certain that this represents another species that went extinct among a majority of past species that did likewise. Birds as we continue to study them, have designed bones with wings and respiratory systems for powered flight. The specified complexities of birds coming from dinosaurs holds no real water. An odd ball such as Anchiornis doesn’t necessarily mean bird evolution.